By Peter Anderson 9 Comments - The content of this website often contains affiliate links and I may be compensated if you buy through those links (at no cost to you!). Learn more about how we make money. Last edited November 17, 2017 . I‘ve been investing in Lending Club for several years now, and over the years I've seen my returns go up and down. Despite a few defaults I've never really seen my returns dip below 9-10%. Those kind of returns are nothing to sneeze at. Lending Club has gone from the new kid on the block with an untested business model, to the biggest player in the peer-to-peer lending arena, being recognized for their revolutionary investing model. In January 2014 they originated over $258.4 million in new loans! Even Google is recognizing their potential as they recently bought a minority interest in Lending Club. It's been a while since I did an update on my portfolio's performance. Admittedly, it's not as big of a portfolio as I'd like, but now that we've closed on our house and paid our 20% down payment, we're ready to start investing more. Before we jump in, however, let's look at some Lending Club news. Last month Forbes announced their list of 25 of the most promising companies for 2014. 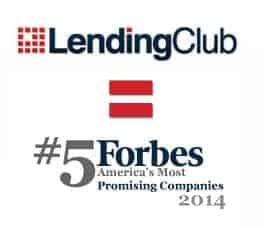 Lending Club has been listed for the past couple of years, last year at number 12 on the list, and the previous year at number 20. This year they move up to number 5 on the list after another great year, including a nice round of investment by Google. Over the course of four months we reviewed hundreds of applications from businesses across the country. The final assessment is based on growth (both in sales and hiring), quality of management team and investors, margins, market size and key partnerships. Then we spoke to each company to make sure we didn’t miss anything. Producing a ranking in the opaque world of privately-held companies is never easy. But we’re confident that many of these are the IPOs and billion-dollar acquisitions of tomorrow. It's nice to know a company that I'm using is being honored for their innovation and sound business practices, and I look forward to another great year for Lending Club! In the last year or two my Lending Club returns have had some hiccups, as I've had a slew of charge-offs and late loans. My returns about a year and a half ago topped out at 12.22%, and since my charge-offs happened the returns have dropped below 11%. Over the past year, however, the returns have slowly been improving to the point where they're now back up to 11.46% as of this month. If you view the new “adjusted net annualized return” numbers that Lending Club includes, that accounts more for the late and in default loans, I'm still around 11% returns. Still not too bad, and better than my other retirement accounts. Since I started with Lending Club I've had 11 charged off loans, and have another 5 loans in default or late. Net Annualized Return of 11.46%: After being at a high of 12.22% a year and a half ago, and a recent low of about 10.83% last year, my returns are back up to 11.46%. Number of defaults. Eleven charged off, 1 in default with 4 late: I've got 11 charged off loans with about $176 in outstanding principal unpaid. There is one A, three B, three C, two D and two E loans charged off. The late loans are three Cs and two Bs, so if you look at the grades of my late and defaulted loans, a majority of the charged off or late loans have been A-C grade (12), while D, E and F grades have only had 4 charge-offs or defaults. Interesting. 99 loans have been paid off: 37 were A grade loans, 30 were grade B loans, 10 were C grade, 7 grade D, 10 grade E, 4 grade F and 2 G. Looks like grade A and B loans are more likely to get paid back early, reducing returns. The earlier a loan is paid off, the less likely you are to be making money, and in some cases you may actually lose money! Another reason to consider investing in lower grade loans. I’m diversified by investing small amounts across multiple loans: I've had 247 loans since joining (130 issued and current or funding loans, 99 paid off), with no more than $25 in each loan. In other words, I'm diversified across a decent amount of loans, lessening my risk from any one loan going into default or getting charged off. Of course to be fully diversified I believe Lending Club recommends 800 or more notes. I'm not there yet, and won't be until later. Now that we've closed on our house and will soon have a re-funded emergency fund, we'll be able to get cracking on investments again. One thing Lending Club and Prosper have been criticized for in the past was that their numbers showing your return on investment were overly optimistic, and that they didn't take into account the age of loans, future default rates, and so on. Lending Club has recently made updates to their site that means you can now view an adjusted net annualized return that will take past due notes into account, and give you a more realistic number. I think I mentioned that my returns on the adjusted value were 11% instead of 11.46%. So ROI is slightly lower when taking into account those past due notes. Nickel Steamroller's Lending Club and Prosper portfolio analyzer, has recently been re-designed quite a bit and now allows you to take an in depth look at both your Lending Club and Prosper accounts. It does a much better job of giving you an idea of your actual ROI. In looking at my returns on the analyzer, my actual return according to the site will be closer to 10.62%. Here's the basic strategy I've been using with Lending Club since I started investing. The strategy has changed a little bit over time to include a lot more low grade loans since I've actually seen a better ROI on those loans. Less than $10,000: I believe I’ll still be sticking with mostly loans below $10,000. Lower amounts mean higher likelihood of payback of the loan. Zero delinquencies: Again, I may fudge slightly on this one, but I still want it to be very few or zero delinquencies. Debt to income ratio below 20-25%: I like to invest in loans where the borrowers have a lower DTI ratio, and preferably have higher incomes. I’ll try to keep this as is. Good employment history: I like loans with a decent employment history of at least 2 years, and a decent income. So that's what I'm doing with my Lending Club portfolio right now, and how I'm investing. Not ready to invest, but looking to consolidate debt or pay off a high interest credit card? You might want to consider borrowing from Lending Club. Check out my post on borrowing from Lending Club. Are you currently investing in Lending Club? How are your returns looking? Tell us in the comments! My Lending Club returns continued improving despite my account having it's first charged off loan. Nice job Peter! Looks like you have found some stability in your returns which is a good place to be as it helps to manage expectations for yourself and those you share your results with. As I get closer to the five-year mark for investing with Lending Club myself, I’ve had a very similar experience as you, and very similar returns (in my original account). I think Lending Club, and peer to peer lending as a whole, is uniquely positioned to continue offering solid returns for investors looking for another means of diversifying their portfolio. Your experience seems to be about par for the course, good stable returns. My account has been pretty stable, and I think this year I’ll definitely be adding more to Lending Club once I max out my Roth IRA. Wow, I didn’t know they made the Forbes top 5. I know Prosper is the other big giant, what do you think of them? Way back when they both first started I think Prosper had a reputation as being not quite as good as Lending Club, having more defaulted loans, and possibly that they had issues with not being careful enough about who they were lending money to. I think they’ve gotten a lot better, and I’ve heard good things about them more recently. While I don’t currently have an account with Prosper, I do anticipate opening one soon and will do a review when I do. Thanks for stopping by! I also participate in LC. I have been buying into loans for about a year and a half. I have had no defaults and I have a return of 17.92%. I have 11 currently in funding of which one is in the grace period and 20 paid off loans. I first heard of LC through this blog and I am extremely happy with the program. I’m glad it has worked well for you as well so far Christine! Please let us know if you have any thoughts. Previous Post: Overspending? Is There A Medical Reason For It? Next Post: Spending And Your Friends: What Happens When You Have Differences In Income?